If you would like us to notify you when our new book is published, please send an email to us at info@nullcinergycoaching.com and put Conflict Mastery Book in the subject line. 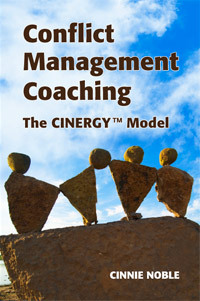 Conflict Management Coaching: The CINERGY™ Model is a comprehensive and dynamic book about coaching people on a one-on-one basis, to improve their skills for managing and engaging in their interpersonal disputes. The text not only describes the research-based coaching model that uniquely combines conflict management, coaching and neuroscience principles. It also shares many forms and ideas that support a coaching practice. Members of the International Coach Federation may purchase the book through ICF’s Virtual Bookstore.